1. Wash and chop cabbage, capsicum, cilantro fine and keep it aside. Wash, peal and chop onions too fine. Grate coconut too. 2. Place a skillet with 1 teaspoon of cooking oil in it on low/medium flame. On heating add chopped capsicum and a little salt to it and let it wilt for a while. Allow it to cool. 3. Place a spatula with 1 teaspoon of cooking oil in it on low/medium flame. When heated add mustard seeds to it. Once it starts spluttering add broken chili pieces, asafoetida , cumin seeds and switch of the flame. After a while season it to the dish. Yummmmmm Enjoy it with rice, dal & papad!!!!! Note: 1′. It is better use fresh veggies for best results as it is consumed raw. 2. Green chili can be used as per your spice level. 3. Check for salt as capsicum already contains while wilting. 4. Seasoning is a must as i have used only red chili pieces for spicyness. 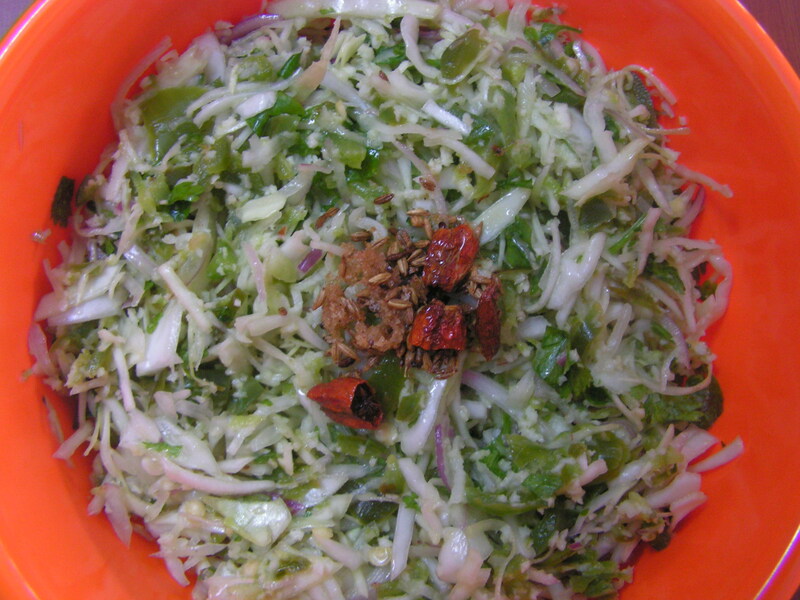 This entry was posted in Uncategorized and tagged kosambari, Salads. 1. Chop banana stem very fine after removing all the fibers in it. 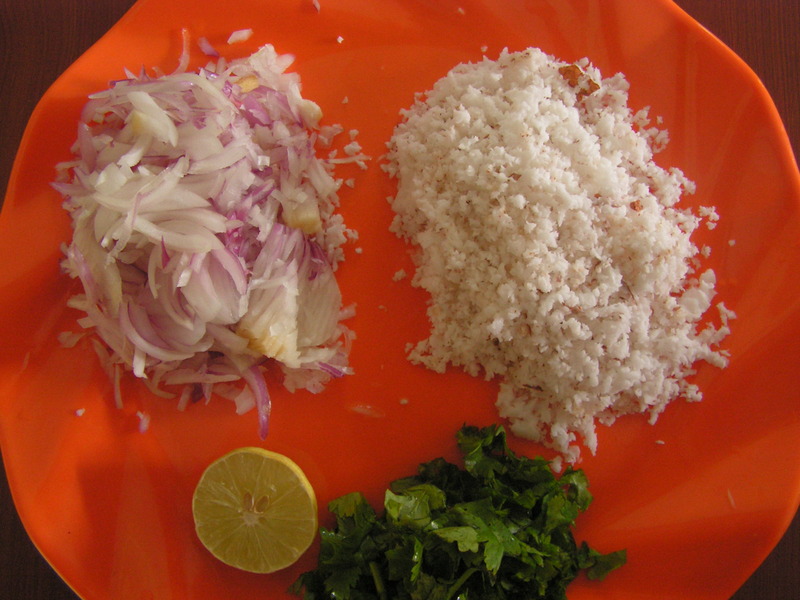 Also wash, peal and chop onions fine, chop cilantro and grate coconut and keep it aside. Dry roast peanuts till you get a pleasant aroma. On cooling peal and powder it in the mixer and keep it aside along with other ingredients as shown in the above image. 2. Transfer all the ingredients in another broad bowl so that one is able to mix it well including salt. 3. Squeeze lemon juice and transfer it to another bowl for a close view of the dish. 1. Banana stem should be fresh and tender as it is eaten raw. 2. Adding peanut powder is one’s option. 3. Curds can also be used in place of lemon juice. This entry was posted in Uncategorized and tagged Lunch side dish, Salads. 1. Wash, peel and grate carrots. Separate the corn kernels from the corn and slit it lengthwise and keep it aside as shown in image-1. 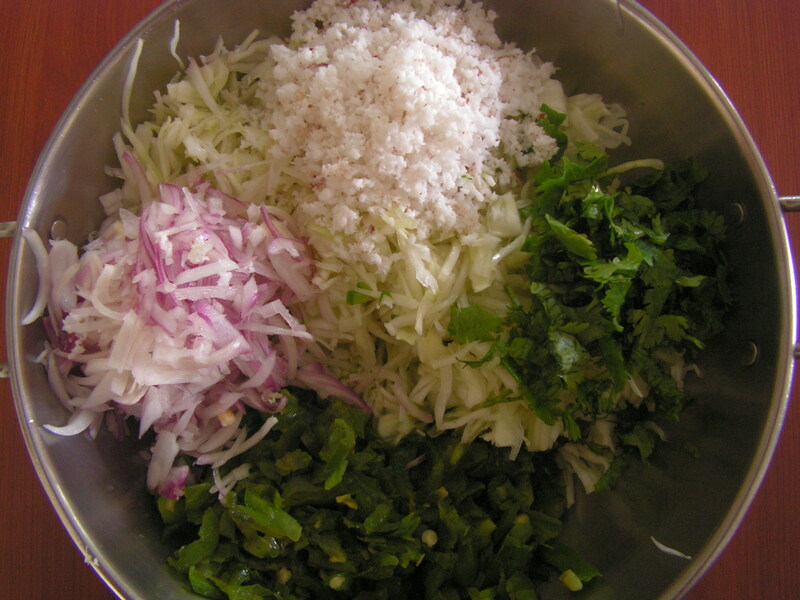 Wash and chop cilantro, grate coconut, and chop green chillies finely too. 2. Mix grated carrots, slit corn kernels, in a bowl. 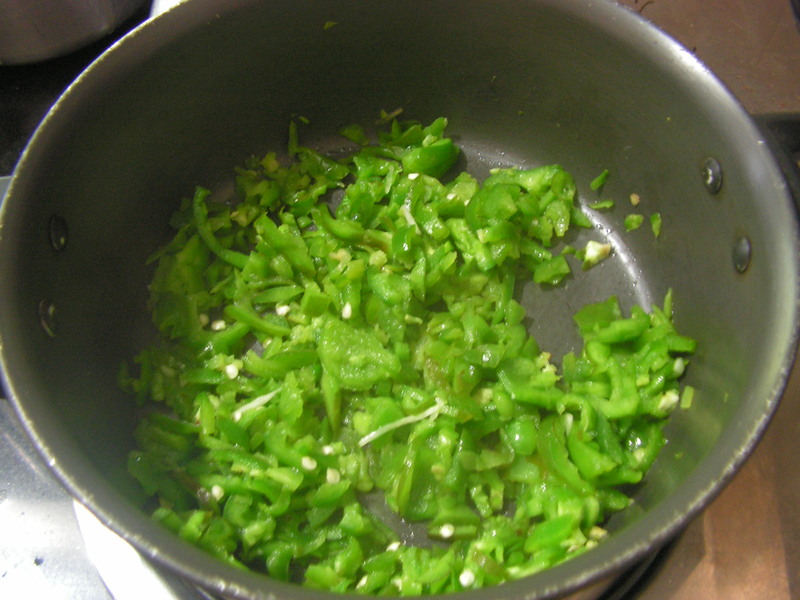 Crush green chilly, salt and mix it with the the veggies in the bowl. Squeeze lemon juice and then add grated coconut, chopped cilantro. Mix the salad vigorously with your hands such that the water let out by veggies gets mixed well. 3. Place a spatula with 1 teaspoon of cooking oil on low flame. When hot, add mustard seeds and when they start spluttering, add red chilly pieces, asafoetida powder and finally just before switching off the flame add curry leaves to it. Season it to the dish. Enjoy! As I always say, Yummmmmmmmmmmmmmm (and healthy). 1. The reason to slit the kernels is to enhance the taste of the dish and retain flavour in the dish while eating. 2. One can even add chopped onions to the dish. 3. Tender sweet corn is preferred for this dish. 4. Seasoning is one’s choice when onions are used. This entry was posted in Sweet corn dishes and tagged Salads. Kohlrabi/German Turnip (English) /Knolkol (Marathi) /Navilkosu (Kannada) belongs to the Brassica family of cabbage, cauliflower, broccoli. I think one reason it isn’t as popular as its sibling vegetables is because of its peculiar pungent odour. 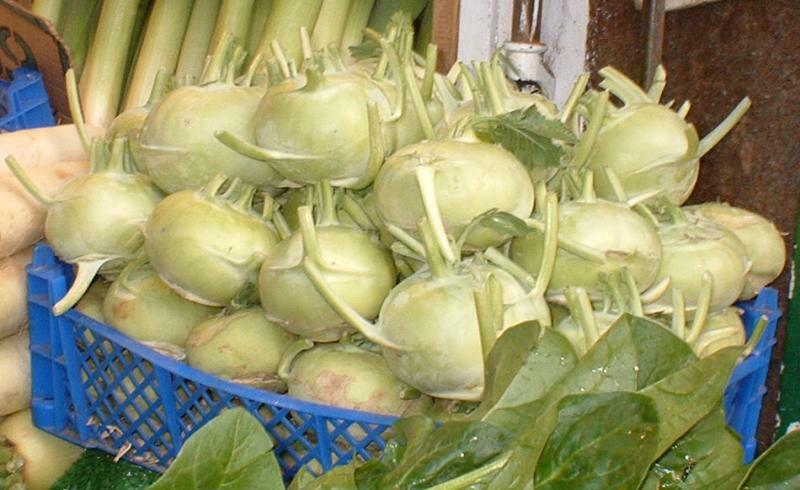 Kohlrabi is used to make an upkari/stir-fry or along with other vegetables in sambar, veg-sagu and in the preparation of salads too. 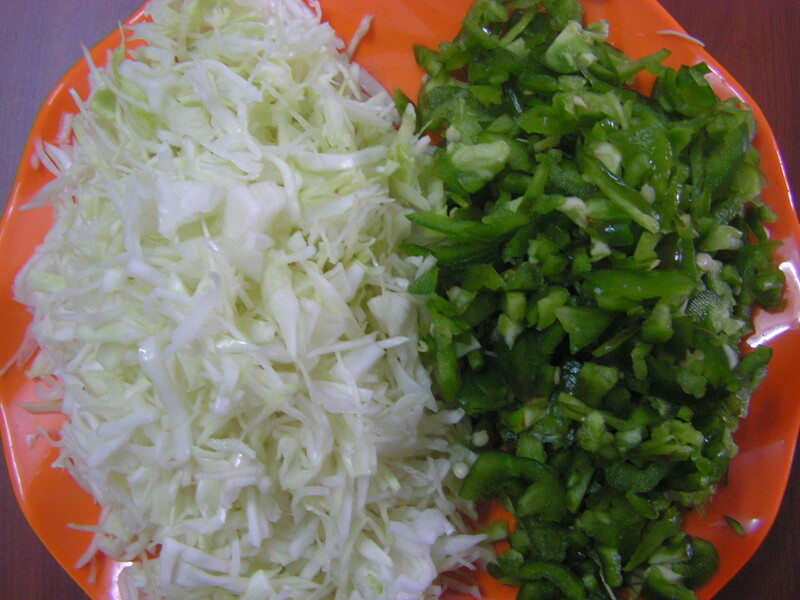 Today I would like to put up a simple salad in combination with onions and lemon juice. 1. Wash, peel and chop the veggie lengthwise and keep aside as shown in image-2. 2. Cook in a cooker adding a pinch of salt to it (do not add water) till done for about 15 minutes. Allow it to cool. 3. Wash, peel and chop onions also lengthwise. Wash and chop green chilly, cilantro and grate coconut and keep aside. 4. On cooling just transfer cooked veggie from the cooker to a bowl and mix chopped onions, grated coconut, chopped green chilly and salt together until they’re well-mixed. Later squeeze lemon juice and also if needed add roasted peanut powder which is optional. Finally add chopped cilantro to it. 1. Preferably tender Knolkol should be used for this dish, it will cook faster with a tender vegetable. 2. Do not add water to while cooking the vegetables. 3. Adding peanut powder is optional. This entry was posted in Uncategorized and tagged Salads. This fairly standard dish can accompany any of your favorite one pot meals. 1. Wash and chop tomatoes lengthwise, coriander leaves fine, peal and chop onions as well lengthwise and keep it aside. 2. Transfer all chopped ingredients from step 1 into a serving bowl as shown in the image below. 3. 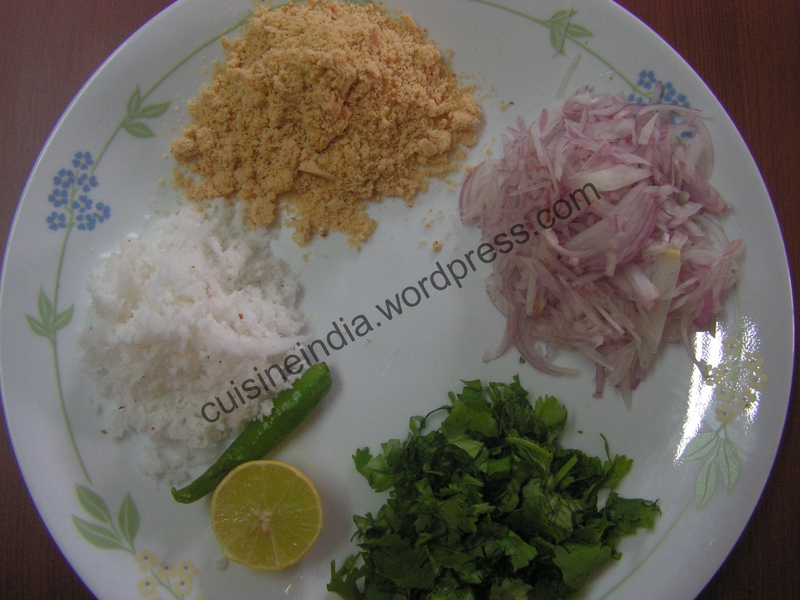 Grind grated coconut, green chilly, cumin seeds and required quantity of salt in the mixer adding required quantity of water to a fine consistency and mix the ground mixture to the tomato onion mix into the bowl from step 2. The raitha is now ready to serve on checking for salt. Carrots is very good from the health point of view. In fact so healthy and recommended that we steam, mash and feed it to the kids as baby food when we start off with solid food for the kids. Apart from a few other salads (with Moongdal, with cabbage ) with carrots among the primary ingredients, I have also put up carrot halwa, carrot roti and fried carrot curry. Today I would love to put up a salad that has carrots in combination with capsicum and peanut powder. Tastes great and like most salads easy to prepare. 1. 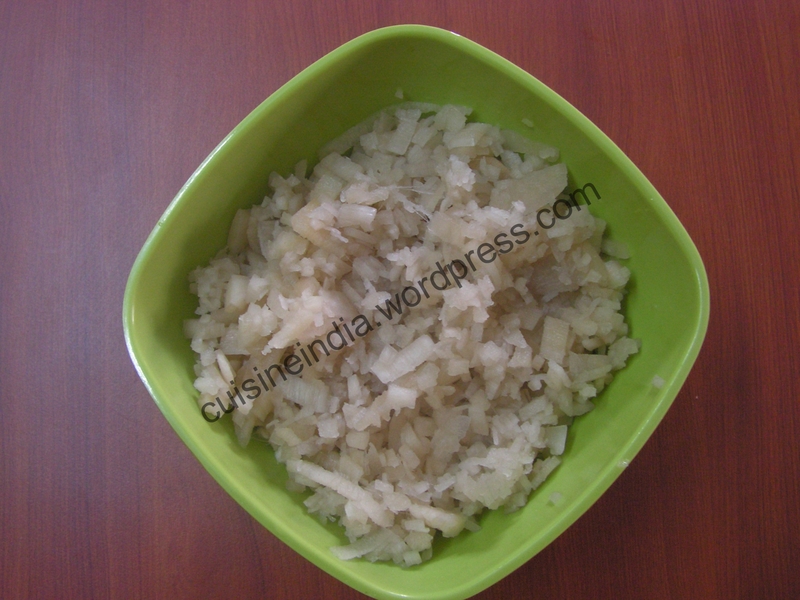 Wash and grate carrots, coconut, chop capsicum, green chilly fine, wash, peal and chop onions fine and keep aside. 2. Place a spatula on medium flame and dry roast peanuts till you get a pleasant aroma. 3. On cooling peal the nuts and powder it in the mixer to a medium consistency and keep it aside with the veggies. 5. Fully fried capsicum will look as under. 6. Transfer grated carrots, chopped onions from step 1 to a broad bowl and stir in peanut powder from step-3 to it. 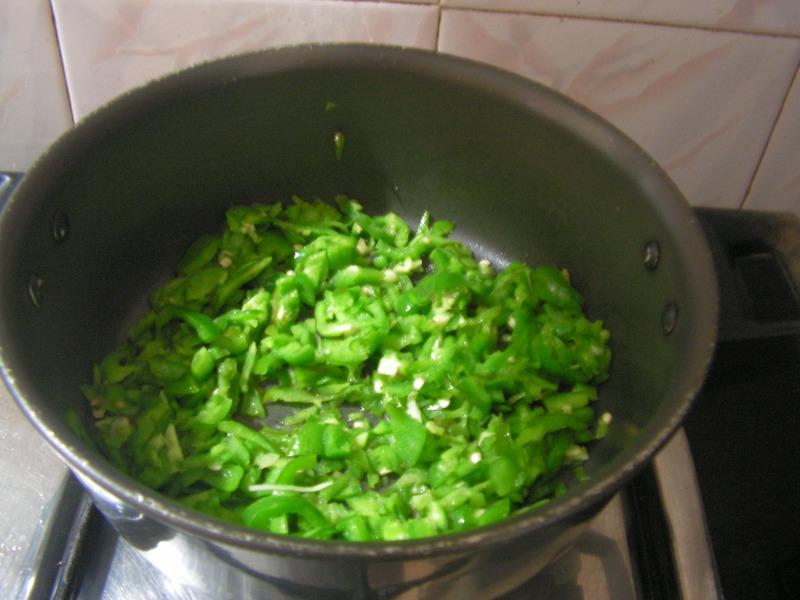 Also add fried capsicum from step 5 as well as chopped chilly and salt from step 1. 7. Finally squeeze lemon juice to it. 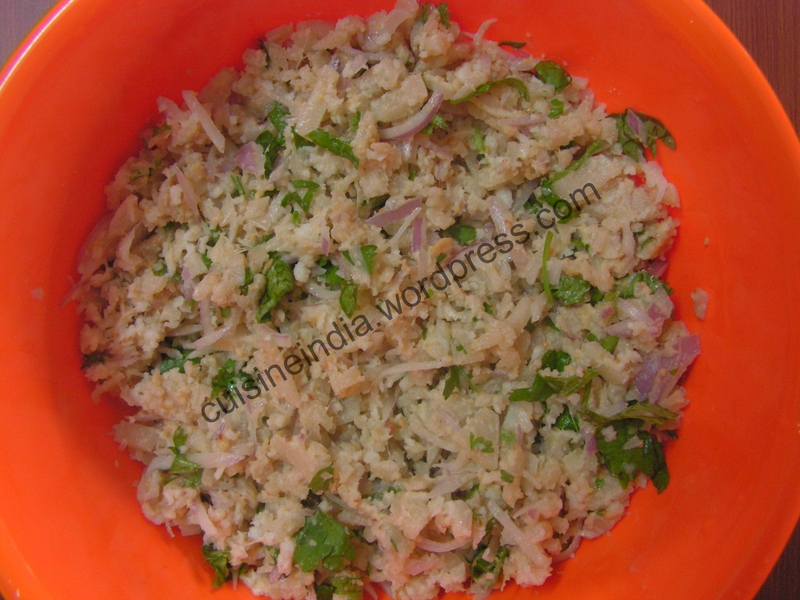 Top it with chopped coriander leaves and grated coconut to the salad which is ready to serve. This entry was posted in CARROT RECIPES and tagged Salads. I see that this post is not being viewed properly in firefox. It works okay in Safari and Internet Explorer. Lentils as part of salad is not new to us – I have already put up Sprouted greengram usli and today I would like to put up yet another dish in the same league. This dish is good recipe to have in your kitty especially if you are just starting off cooking – simple but tasty and nutritious. 1. Soak white peas in water overnight for about 10-12 hours. 2. 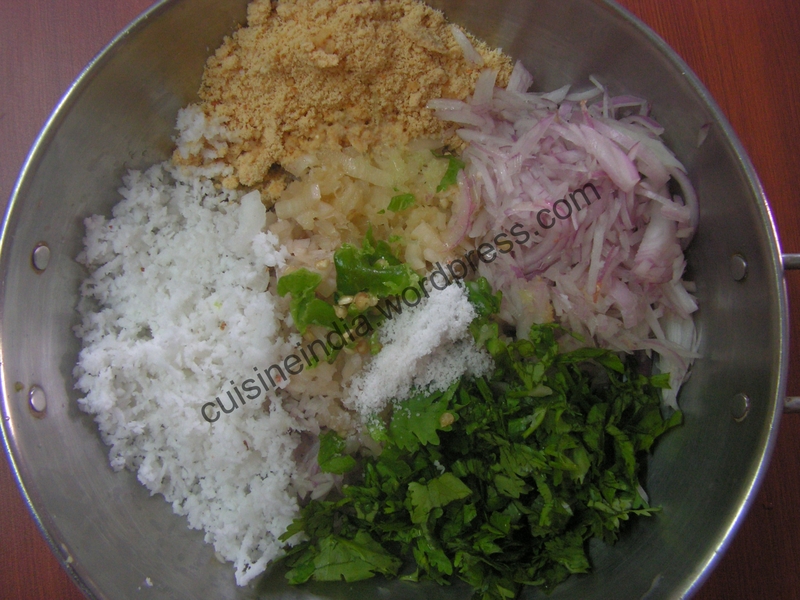 Chop green chillies , coriander leaves and grate coconut and keep it aside. 3. Add 2 cups of water to it and cook it in cooker as usual till done adding a few drops of cooking oil to it. Cooked white peas is as shown in the image below. 4. Place a skillet with 3-4 teaspoons of cooking oil in it on the flame. When heated add mustard and blackgram dal to it. 5. When both mustard and blackgram dal is fried add cumin seeds to it. When it sputters add Turmeric powder,chopped green chillies and curry leaves to it. 6. Now add cooked white peas from step 3, salt, sambar powder and chopped coriander leaves and grated coconut from step 2 to it and saute well. Ready to serve white peas usli is as shown in the image below. Enjoy with either chapati or even rice and dal.